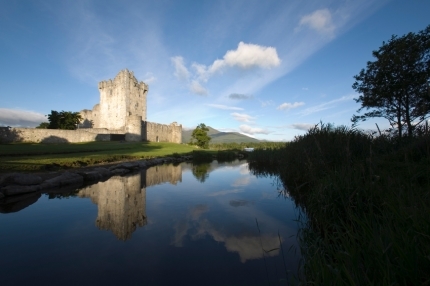 Any trip to Ireland has a mix of idyllic landscapes, rich culture and many miles of paved, quiet roads. This is certainly true for this bicycling trip to the Kerry and Dingle peninsulas. In this magical, sometimes challenging countryside, you are dazzled by the rocky peaks and neatly cultivated fields dotted with grazing sheep. Kerry is considered to be Ireland’s most gorgeous peninsula. It embodies the tough romantic spirit of Ireland. We ride through Muckross National Park to the picturesque village of Sneem on the Inveraugh Peninsula. Soon afterward we cycle into Glenbeigh past Celtic fortresses waiting to be explored. We stop at the fishing town of Dingle where you have time to explore the area on your own. Framed by its fishing port, the peninsula's charming little 'capital' manages to be quaint without even trying. Meet the Dingle dolphin or scour the deserted parts of the peninsula for incredible vistas and “ogham” stones. Return to Killarney via the Black Valley.